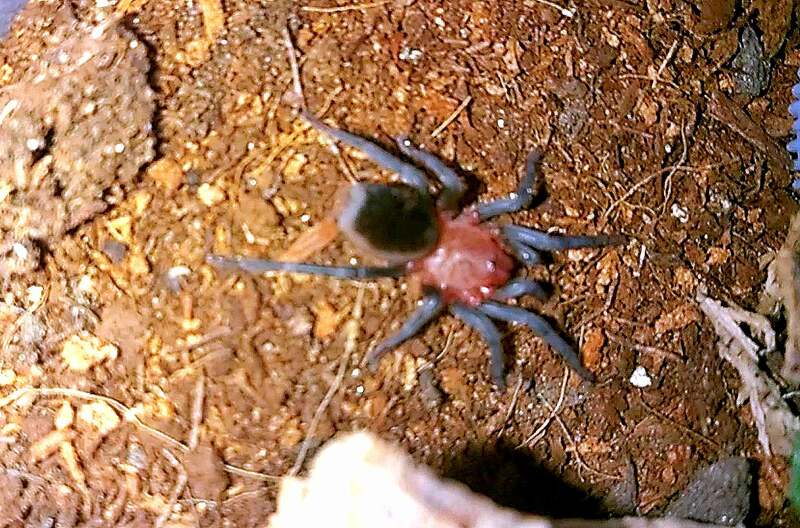 When I first encountered this unique tarantula, it was known as the Maraca cabocla or “Brazilian Redhead”, and I was immediately enamored with its build (and, if I’m being honest, with its funny name). With its deep red carapace and long, lithe, tapered legs, it bore more than a passing resemblance to a true spider, and I wondered why this species wasn’t more prevalent in the hobby. While doing research on its husbandry, I discovered that information was rather sparse and often conflicting. Some kept it dry while others kept it moist. Some reported fast growth rate while other reported less frequent molts with modest size gains. I was fortunate enough to find tips from a keeper who had successfully bred this species to get me started. Having kept these guys for a while, and with several folks asking me about their care, I figured it was time to share some of my observations. A hardy species offering some husbandry wiggle room. I acquired my two slings about a year ago at about .3” or so. Both were housed in dram bottles with about 2.5” of moist substrate, and both quickly dug a system of complex tunnels straight down to the bottom. It seems if given the substrate depth, this species will dig. Over time, I allowed the substrate to dry out a bit and just periodically moistened part of it by carefully pouring some water down the sides of the bottles. Although I’ve heard some keepers report that their B. caboclas gravitated toward moisture, mine haven’t shown any preference for it. In their natural habitat, this species experiences a several months long dry period followed by a rainy period, so it seems to be physiologically equipped to deal with the two extremes. My B. cabocla specimens have proven to be slower growers. Both are currently kept at temperatures that range 72-76 in the winter and about 75-80 in the summer. Since I acquired them, they have both molted about three times each and are both just over 1” in size now. Both are now showing some of their adult colorations as well, which is quite cool. As tiny slings, I would feed them pre-killed baby crickets or pieces of mealworm. When still very small, my two specimens were not particularly voracious eaters; they would occasionally refuse meals when not in premolt and seemed intimidated by live prey. Once they put on a bit of size, they seemed to develop better prey responses. Mine now have no trouble chasing down small crickets. I have spoken to a keeper who has experienced slightly faster growth rates with hers as she keeps it in warmer temperatures year round. As always, warmer temps will lead to faster metabolisms and growth rates, so it’s very possible that caboclas kept at higher temps will grow much faster than mine have. During the first winter that I kept my cabocla slings, both buried themselves, covering up the entrances to their burrows completely. In one instance, I was able to see the sling at the bottom of his burrow through the pill bottle. The other sling, however, covered up all openings, and it almost appeared that the tunnels had possibly collapsed. Now, I warn keepers all of the time not to disturb their spiders if they should bury themselves. After all, tarantulas know what they are doing, and if they suddenly disappear into their dens, you can bet that there’s a good reason for it. However, after three months of seeing no signs of life, I succumbed to my impatience and carefully dug through the sub to find the little guy. What I first mistook to be a shriveled corpse proved to be a molt; the actually spider, a bit larger now and obviously upset, popped out a moment later. That’s the last time I don’t follow my own advice. Now that the slings have put on a bit of size, I have moved them both to16-oz deli cups with a couple inches of substrate, cork bark for hides, and bottle cap water dishes. Both have taken to the hides and have done a bit of digging. Temperament-wise, they have proven to be a bit skittish, often bolting directly to their burrows when disturbed. Once the largest of the slings hit the 1” mark, it began hanging out on the surface much more and seems a bit less likely to run when disturbed. It also has no problems chasing down and subduing small crickets, seemingly having outgrown its fear of moving prey. As far as the experience level needed for this species, I would think that it could easily be kept by someone new to the hobby as long as they were cognizant of it’s flighty behavior. Check out one of my B. cabocla slings in the video below! For those looking for a unique, beautiful, medium-sized T that’s tough as nails, the B. cabocla should definitely be a consideration. I’ve been seeing more an more of these guys on the market, and I’m hoping that they start getting the attention that they deserve. I agree with everything here. In fact it was Tom’s advice along with my love of the colors red and black that prompted my choice of B. Cabocla for my first tarantula. Mine doesn’t seem to want to burrow but rather hang out visible in his hide all day. Thanks! The larger of my two is becoming a bit more visible now, so I’m hoping that this proves to be the norm. The smaller one JUST molted, so I’ll have to see if it spends more time above ground now. I have a friend in Poland that I buy from regularly, who had these little guys available on his website for a while – but he wasn’t able to get a picture of an adult (he mostly sells slings) so I didn’t want to buy something when all of my searches revealed nothing! Thanks to you I now know I need one, and will be getting one as soon as he has more in stock. Ha! Great story. Glad to hear I’m not the only one who’s dug a spider up (and, consequently, made it quite angry). Awwww…the name “Ziggy Stardust” would be awesome. You’ll have to use that eventually. Haha, almost none of my tarantulas behave as they’re “supposed” to (apart from my MM G. pulchripes, who is a big laid back lump). So when the irminia disappears it’s unusual, otherwise we would have left it alone. I’ve not seen my P. met in a while, but I *know* it recently moulted so I’m not worried provided food still disappears. Me again (previously Missus Tribble). I have a Bumba now, which has eaten since being with me, but appears to be premoult. How big do these pretty little guys actually get? I can’t find any information on their adult size!